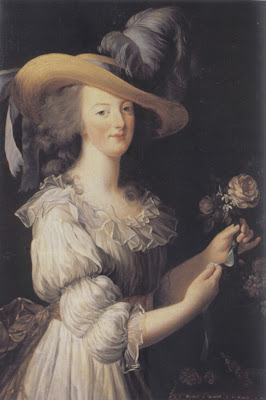 Madame Vigéè Le Brun was one of the most famous and sough-after portraitists of her time. She was also a favourite of Marie Antoinette and, over the years, Madame Vigéè Le Brun, would paint numerous portraits of this tragic Queen. 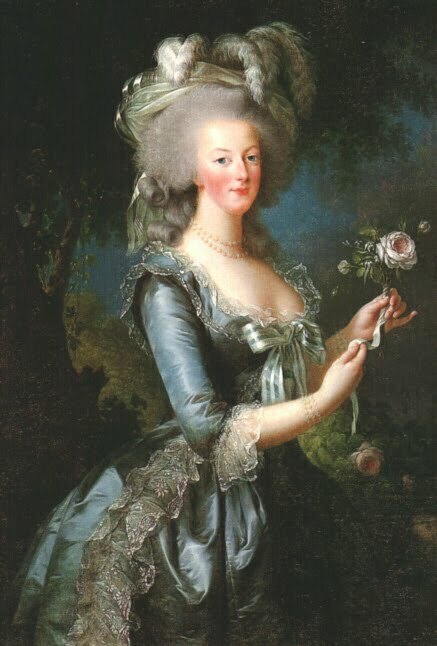 Her paintings have become so iconic that, when we think of Marie Antoinette today, we conjure up images of her holding a rose in the gardens of the Palace, wearing a simple muslin dress and a straw hat, or sitting down surrounded by her children (and an empty cradle). All portraits painted by Madame Vigéè Le Brun. And while they may not be the most realistic representation of her likeness, the Queen’s charming personality and elegance certainly shines through in these paintings. But let’s see what Madame Vigéè Le Brun has to say about the Queen in her memoirs, shall we? It was in the year 1779 that I painted the Queen for the first time; she was then in the heyday of her youth and beauty. 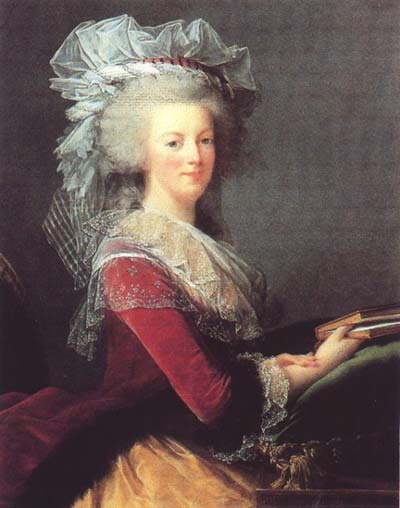 Marie Antoinette was tall and admirably built, being somewhat stout, but not excessively so. Her arms were superb, her hands small and perfectly formed, and her feet charming. She had the best walk of any woman in France, carrying her head erect with a dignity that stamped her queen in the midst of her whole court, her majestic mien, however, not in the least diminishing the sweetness and amiability of her face. To any one who has not seen the Queen it is difficult to get an idea of all the graces and all the nobility combined in her person. Her features were not regular; she had inherited that long and narrow oval peculiar to the Austrian nation. Her eyes were not large; in colour they were almost blue, and they were at the same time merry and kind. Her nose was slender and pretty, and her mouth not too large, though her lips were rather thick. But the most remarkable thing about her face was the splendour of her complexion. I never have seen one so brilliant, and brilliant is the word, for her skin was so transparent that it bore no umber in the painting. Neither could I render the real effect of it as I wished. I had no colours to paint such freshness, such delicate tints, which were hers alone, and which I had never seen in any other woman. At the first sitting the imposing air of the Queen at first frightened me greatly, but Her Majesty spoke to me so graciously that my fear was soon dissipated. It was on that occasion that I began the picture representing her with a large basket, wearing a satin dress, and holding a rose in her hand. This portrait was destined for her brother, Emperor Joseph II., and the Queen ordered two copies besides – one for the Empress of Russia, the other for her own apartments at Versailles or Fontainebleau. I painted various pictures of the Queen at different times. In one I did her to the knees, in a pale orange-red dress, standing before a table on which she was arranging some flowers in a vase. It may be well imagined that I preferred to paint her in a plain gown and especially without a wide hoopskirt. She usually gave these portraits to her friends or to foreign diplomatic envoys. One of them shows her with a straw hat on, and a white muslin dress, whose sleeves are turned up, though quite neatly. 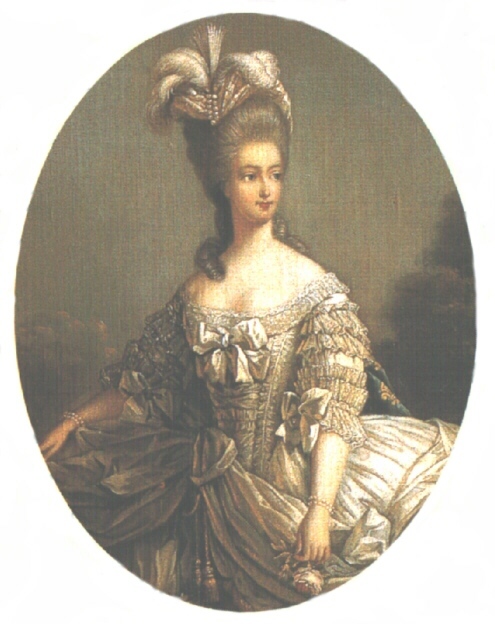 When this work was exhibited at the Salon, malignant folk did not fail to make the remark that the Queen had been painted in her chemise, for we were then in 1786, and calumny was already busy concerning her. Yet in spite of all this the portraits were very successful. Toward the end of the exhibition a little piece was given at the Vaudeville Theatre, bearing the title, I think, “The Assembling of the Arts.” Brongniart, the architect, and his wife, whom the author had taken into his confidence, had taken a box on the first tier, and called for me on the day of the first performance. As I had no suspicion of the surprise in store for me, judge of my emotion when Painting appeared on the scene and I saw the actress representing that art copy me in the act of painting a portrait of the Queen. The same moment everybody in the parterre and the boxes turned toward me and applauded to bring the roof down. I can hardly believe that any one was ever more moved and more grateful than I was that evening. I was so fortunate as to be on very pleasant terms with the Queen. When she heard that I had something of a voice we rarely had a sitting without singing some duets by Grétry together, for she was exceedingly fond of music, although she did not sing very true. As for her conversation, it would be difficult for me to convey all its charm, all its affability. I do not think that Queen Marie Antoinette ever missed an opportunity of saying some thing pleasant to those who had the honour of being presented to her, and the kindness she always bestowed upon me has ever been one of my sweetest memories. One day I happened to miss the appointment she had given me for a sitting; I had suddenly become unwell. The next day I hastened to Versailles to offer my excuses. The Queen was not expecting me; she had had her horses harnessed to go out driving, and her carriage was the first thing I saw on entering the palace yard. I nevertheless went upstairs to speak with the chamberlains on duty. One of them, M. Campan, received me with a stiff and haughty manner, and bellowed at me in his stentorian voice, “It was yesterday, madame, that Her Majesty expected you, and I am very sure she is going out driving, and I am very sure she will give you no sitting to-day!” Upon my reply that I had simply come to take Her Majesty’s orders for another day, he went to the Queen, who at once had me conducted to her room. She was finishing her toilet, and was holding a book in her hand, hearing her daughter repeat a lesson. My heart was beating violently, for I knew that I was in the wrong. But the Queen looked up at me and said most amiably, “I was waiting for you all the morning yesterday; what happened to you? “No, no! Do not go!” exclaimed the Queen. “I do not want you to have made your journey for nothing!” She revoked the order for her carriage and gave me a sitting. I remember that, in my confusion and my eagerness to make a fitting response to her kind words, I opened my paint-box so excitedly that I spilled my brushes on the floor. I stooped down to pick them up. “Never mind, never mind,” said the Queen, and, for aught I could say, she insisted on gathering them all up herself. 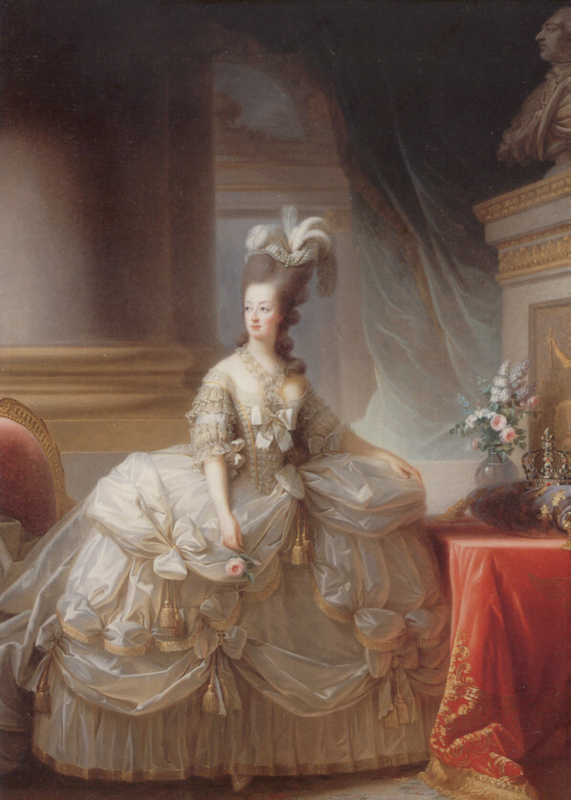 The picture was placed in one of the rooms at Versailles, and the Queen passed it going to mass and returning. After the death of the Dauphin, which occurred early in the year 1789, the sight of this picture reminded her so keenly of the cruel loss she had suffered that she could not go through the room without shedding tears. She then ordered M. d’Angevilliers to have the picture taken away, but with her usual consideration she informed me of the fact as well, apprising me of her motive for the removal. 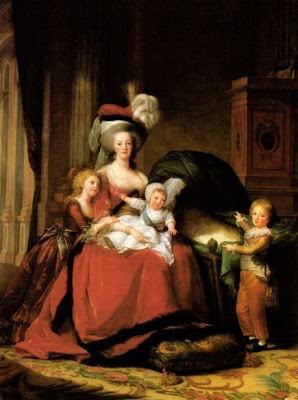 It is really to the Queen’s sensitiveness that I owed the preservation of my picture, for the fishwives who soon afterward came to Versailles for Their Majesties would certainly have destroyed it, as they did the Queen’s bed, which was ruthlessly torn apart. I never had the felicity of setting eyes on Marie Antoinette after the last court ball at Versailles. The ball was given in the theatre, and the box where I was seated was so situated that I could hear what the Queen said. I observed that she was very excited, asking the young men of the court to dance with her, such as M. Lameth, whose family had been overwhelmed with kindness by the Queen, and others, who all refused, so that many of the dances had to be given up. The conduct of these gentlemen seemed to me exceedingly improper; somehow their refusal likened a sort of revolt – the prelude to revolts of a more serious kind. The Revolution was drawing near; it was, in fact, to burst out before long.